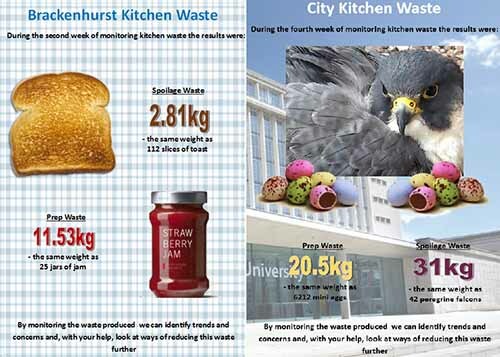 Dine outlets across Nottingham Trent University measure their food wastage for Green Impact. Food caddies are being rolled out across the NTU campuses but the catering team wanted to step up the food waste challenge and tackle prep and spoilage waste from the main Dine outlets. Each Dine kitchen was asked to record their food waste on a daily basis, the data is then collected and communicated weekly via posters in the kitchen. Going forward the data will be analysed to identify any patterns in the levels of food waste and interventions will be developed accordingly.